Syrian army has launched ground and air attacks against rebels in parts of Aleppo, activists say. Rebels with the Free Syrian Army (FSA) say they have repelled an army incursion and destroyed tanks, but there is no independent verification. Western nations have warned of a potential massacre in Aleppo, Syria’s most populous city. Early on Saturday morning, activists said Syrian tanks began moving in on south-western districts of the city. They said the bombardment of rebel-held areas intensified in the early morning, with military aircraft overflying the city at low altitudes. Many casualties have been reported, our correspondent says, and a steady stream of vehicles carrying families is leaving Aleppo. Syrian state television said that rebels, having failed in Damascus, were now trying to turn Aleppo into a den for their terrorism. 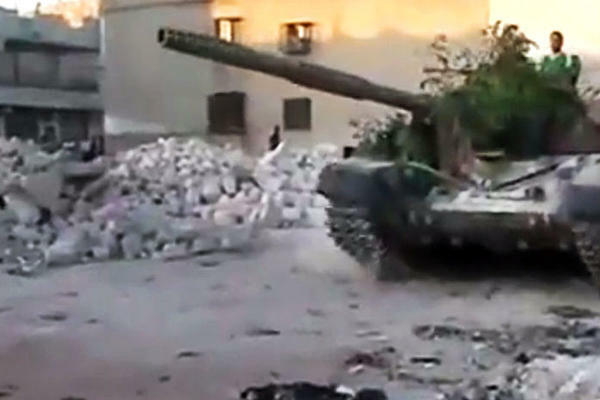 The rebels say they have destroyed a number of tanks, but their claim cannot be independently verified. The rebels are vastly outgunned and outmanned by forces loyal to Syrian President Bashar al-Assad. Activists have reported violent clashes around the Salah al-Din and Hamdanieh quarters near the centre of Aleppo. An emergency call has gone out to doctors to come to Salah al-Din and help if they can, our correspondent says. On Friday, the Red Crescent suspended some of its operations in Aleppo because of the heavy fighting. Rebels had been stockpiling ammunition and medical supplies in preparation for the expected assault. Both sides are braced for heavy casualties. “Rebels are stationed in narrow streets, in which fighting will be difficult,” a government security official told the AFP news agency. The Syrian Observatory for Human Rights said 160 people were killed across Syria on Friday. The fighting comes after two weeks during which rebels made significant gains. On 18 July, an attack at Syrian security headquarters in Damascus killed four senior officials, including the defence minister and President Bashar al-Assad’s brother-in-law. The Free Syrian Army (FSA) took control of several parts of Damascus before being driven out by a government counter-offensive. The rebels also seized several border crossings with Turkey and Iraq. There has been fighting around Aleppo for the past week, with the government deploying fighter jets and helicopter gunships to beat back the rebels. Until recently, Aleppo and Damascus had been relatively free of the violence that has wracked other parts of the country. Earlier this week, thousands of government forces were moved from the border with Turkey to join fierce fighting in Aleppo, activists said. On Friday, UN Secretary General Ban Ki-moon urged the Syrian government to halt its offensive and demanded a clear statement that chemical weapons would not be used under any circumstances. Syria has implicitly acknowledged that it has chemical weapons but says it will not use them against its own people, only against foreign invaders. The former head of the UN monitoring mission in Syria, Maj. Gen. Robert Mood, said it was “only a matter of time” until President Bashar al-Assad was ousted. On Sunday, the Syrian Observatory for Human Rights reported that at least 19,106 people had been killed since March 2011. The UN said in May that at least 10,000 people had been killed. Syria blames the violence on foreign-backed “armed terrorist gangs”. In June, the Syrian government reported that 6,947 Syrians had died, including at least 3,211 civilians and 2,566 security forces personnel.